We believe that community beautification leads to healthier, safer and more economically vibrant neighborhoods. Here’s how we work to build a cleaner and greener Philadelphia every day. Neighborhoods that are beautiful to look at are beautiful to live in, work in and visit. Landscaping, graffiti abatement, tree plantings, and litter cleanups are shown to have immediate, positive effect on how a neighborhood is perceived. People and businesses move in and stay in, tourism flourishes. Keep Philadelphia Beautiful works to keep our neighborhoods clean and green through community service opportunities, education, and working hand-in-hand with neighborhood based organizations throughout Philly. Litter has social, economic, and health impacts on our communities – which is why we spearhead and support community cleanups, work with the School District to conduct education programming and support teachers throughout Philadelphia, and convene local stakeholders to spread local knowledge and take coordinated action. Every year, Philadelphians dispose of nearly 1.5M tons of commercial and residential waste. Garbage isn’t something most of us think about every day, but managing all that waste has concrete environmental and economic consequences. Everything we throw away has to go somewhere. While Philadelphia is making gains in the effort to reduce the amount of waste produced each year and to improve the way we deal with garbage, there is still work to do. Be Inspired by our 2017 Zero Waste Photo Campaign highlighting Philadelphians taking action every day to reduce the amount of waste they send to landfills. Read the blog post and view the Facebook album. Take the Philly Recycling Quiz! What is Zero Waste? Check out CleanPHL.org! Keep Philadelphia Beautiful’s programming is developed and implemented in partnership with our Streets Department and other city agencies, the School District, and neighborhood based organizations in every section of the city. We serve on Mayor Kenny’s new Zero Waste and Litter Cabinet (visit cleanphl.org to learn more), and are a partner in the School District’s new sustainability management plan GreenFutures. 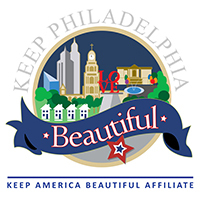 Keep Philadelphia Beautiful is our city’s affiliate for both Keep America Beautiful and Keep Pennsylvania Beautiful. We can all make a difference in the appearance of our communities each and every day. Changing a societal norm like littering begins with each of us. Set an example for others, especially co-workers, friends and children by using receptacles and NOT littering. Carry a litterbag and portable ashtray in your car . If you are a smoker, carry and use a portable or pocket ashtray. Don’t set out your trash too early. Assure easy access to dumpsters by employees and contracts. Check dumpsters daily to see that top and slide doors are closed. This prevents scavengers from spreading trash around the ground. Cover all open loads on trucks leaving your business. Encourage vendors and contractors to do the same! Provide ash and trash receptacles at entrances, exits, loading docks, picnic areas as well as in packing lots and along walkways of your business. Remember, these should be placed where the people are! And remember, whether at home or at work, we can all make a difference by recycling all that we can – and replacing disposable items with reusable ones!